I've been busy making red things the last few days. I am calling this red and gold series Crimson Fire. 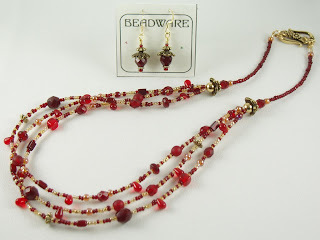 Some fun and easy to wear bangles, sparkly triple strand necklaces and assorted earrings. I've got several more ideas in my head I hope to make this week. All have been SOLD. I belong to a group of artists called EtsyRain which is made up of artists in the Seattle area who have online stores on the website Etsy. There are not many options for events to sell our items at this time of year, so several of us decided to do our own. 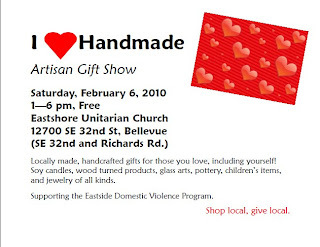 The sale will be in Bellevue on Feb 6th 1-6pm!! There will be jewelry, textiles, pottery, paintings, and photography. I will post more info when I get it as well as send out a flier to my email list. This will be only my second venture over to the other side of the pond to sell my wares. If you have friends in that neck of the woods I hope you will tell them about the sale. 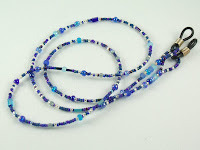 I have added two more eyeglass leashes to my online boutique. Bits 'n Pieces is a fun and whimsical multi-colored version while Ocean Blues is various shades of blue and silver. Silver-plated findings are electroplated, which means a thin coating of 100 percent silver is chemically deposited on base metal. The silver layer is bonded to the base metal via electric current. The quality of silver-plate is determined by the thickness of the silver coating. Examples of base metals include iron, steel, copper, brass, nickel, and zinc. Most of the findings I use have copper or brass as the base. I do recommend using polishing cloths. They work amazingly well, are very easy and not messy. When you do polish, do not keep polishing the item just because the polishing cloth continues to discolor and turn black. When the item appears shiny and lustrous, you're done! I think the best cloth is the Sunshine Polishing Cloth. I have found a good source to buy some in bulk and will soon have them for sale. Stay tuned! I made a number of these at the request of several folks who were looking for pretty ways to hang onto their glasses. 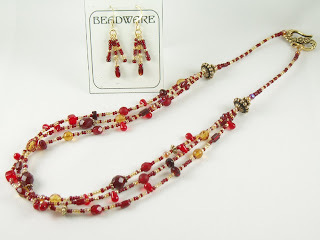 This one features ruby red and wine red fire-polished crystals, cardinal red seed beads, clear glass teardrops and cubes, and red glass rounds. The eyeglass holders are clear plastic with silver plate. 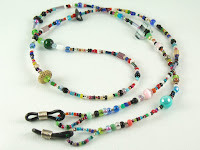 The total length (including eyeglass holders) is 29 inches. I also have these in blue, green, orange, pink and multi-color. The name for this wine-colored gemstone comes from the Latin granatus for "seedlike," because the crystals resemble pomegranate seeds. Garnets also come in yellow, orange, green, pink, white and gray. These stones form under high temperatures and/or pressures, and can be used by geologists as a gauge of the temperatures and pressures other rocks in the vicinity have endured. They are also an indicator mineral for diamonds. The traditional way of finding diamond deposits is to sample materials at the surface, looking for minerals, such as garnets, that are often formed with diamonds, but in much greater quantities. Garnets are found in Kenya, Sri Lanka, Thailand, Brazil, India, Madagascar, Canada, the U.S.A., the Czech Republic and Spain. According to legend, Noah suspended a finely cut, glowing garnet to illuminate the ark and steer it through the dark night. Garnets also are found in jewelry from the ancient Egyptians, Greeks and Romans, and have best been known as the warrior's stone. Soldiers carried garnet to ward off death and injury, and it also was used as a weapon against enemies by being shot out of a gun. The gemstone was set in shields, buckles and other items worn by Crusaders, and Italian widows commonly wore the gemstone in jewelry. Slices of garnet were also used as a mark of distinction in the windows of churches and temples. 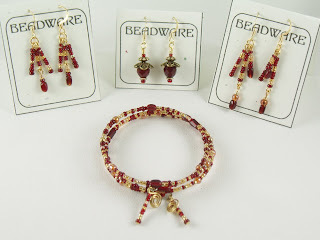 Garnets symbolize fire, faith, courage, truth, grace, compassion, constancy and fidelity. It is a stone of healing and is used to treat disorders of the blood, heart, and lungs. They are believed to stimulate the bloodstream and pituitary glands, and to combat depression, lethargy and nightmares. Garnets are to be carried close to the body to maximize their balancing and peaceful energy, and are said to protect travelers from harm. 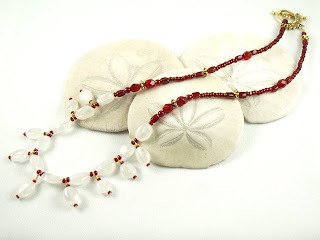 Metaphysical Properties- Red Garnet opens the root chakra while drawing earth energy into the body. Stimulates life-force, boosts sexuality and fertility. It works to move energy though the light body and circulatory system. Garnet also deals with issues of survival and abandonment. It is as a stone of purification, elimination and cleansing. 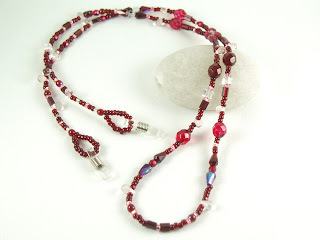 Numerology- Red Garnet vibrates to the number 2. The number 2 is about partnerships, cooperation and gentleness. The color Red - symbolizes energy, strength, physical existence, and vitality. It is associated with the material side of life (abundance) and survival issues. It is used to increase circulation and to energize the nervous system. Red increases your connection with the Earth, it gives strength and will to live in the physical world.